GREAT PROJECT!!!!!! Wow. So simple! does stan have his flasks there ready to sample the water? Hi Jennie- yep! We had some old window screen material lying around and it’s working pretty well so far. Could we see a picture of it in action taken STRAIGHT DOWN at it from above? I’m especially wondering where you put the piece of PVC to keep the hose standing up straight. Ohhhh…..NOW I think I’ve figured it out! I thought the piece of mesh was just below the top edge of the pot! Now I realize that the piece of mesh is UNDER the pot and the hose just sticks straight up in the water! I thought that the piece of hose was being supported by being stuck thru mesh near the TOP edge of the pot. So now I understand why you said to use a piece of PVC pipe that runs from the inside bottom of the pot almost all the way to the top. The perspective in img_1261 was confusing me – did you ORIGINALLY use another piece of mesh INSIDE the pot? before you came up with the PVC? Hi mto- haha it sounds like you got it right. There is actually still a piece of mesh (expanded metal) inside the pot. The PVC makes the curvy hose stand up straight, but without something (the mesh) to hold it upright, it would just lean over to the side. I’d like to find a better solution for having the PVC stand straight up, since the mesh rusts like crazy. Any ideas? Mind you, the OTHER mesh (screen material, which was originally expanded metal before we realized how bad it rusted), is BELOW the pot. So there ARE *2* pieces of mesh needed, right? I don’t know (have to go shop) but is there stainless steel mesh? I know there is fine stainless mesh, but I don’t know if there is window screen-size-hole stainless. We secure our PVC pipe that holds the plastic hose to the bottom of the pot with plumbers putty. Just roll a 1 inch coil of the putty and wrap it around the pipe. Let it cure according to the directions before adding the water. It is strong enough to keep the pipe centred and standing up straight. Couple suggestions to your fine post. If you want to use the expanded metal, try coating it thoroughly with rustoleum or rust inhibiting spray paint that can get into the fine crevices. It has nice body for your purposes that window screen just doesn’t. Couple treated wood slats at the base (top of bucket) could replace the L brackets and screen by drilling holes and tying into place through bucket and boards. Second thought is to use tub and tile silicone caulk to support your pvc at the base. You’ll need to brace it from the top till dry, but you can make a mountain since it is interior. I love the fountain and glad you posted it! I just filled in a fish pond and an building a deck over it, this will be the perfect project to add back the trickling water sound and use the “container” that is already in the ground from the pump housing. Idea for inside – get a PVC X connector, put one end on the pipe that is holding the hose, cut two pieces of pipe to go out at right angles and just fit the width of the pot. 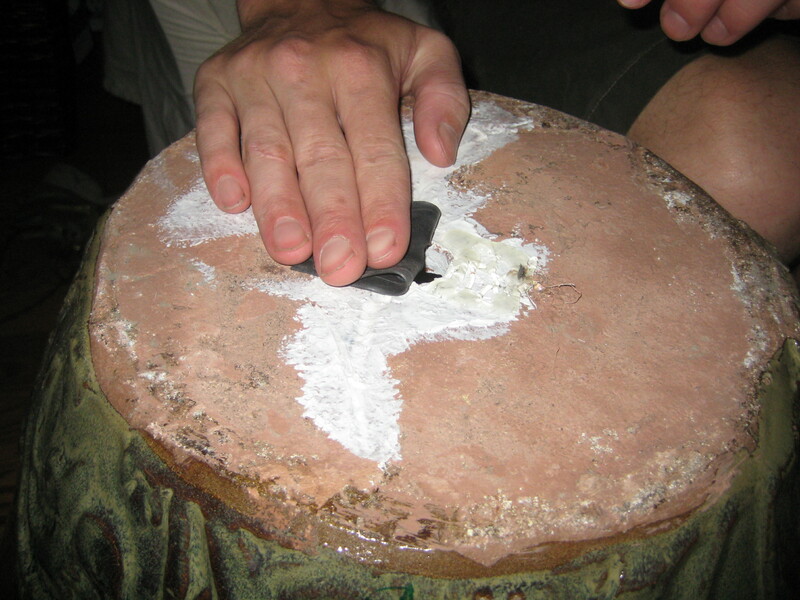 You might have to caulk the ends to the side of the pot for more stabilization but it should work. If you wanted to make sure it wasn’t visible you could cut the vertical pipe that is supporting the hose and have part of it going down and a shorter bit sticking up. I would think an short bit of PVC pipe would be rigid enough to stay straight up. I have seen online where they put the pump inside a plastic gallon milk jug with holes punches in it to let water in. The jug is wrapped with quilt batting, secured on outside of jug with wire, bungees or even rubber bands. It makes a super filter for the pump, and one only has to replace the batting once a year. Might want to check this on google. It will be interesting to see how all the parts hold up over time. As you noted, the metal parts will eventually rust. I wondered about the PVC deteriorating in sunlight too. To support the pvc pipe, why not just fill the pot with rocks around the pipe until you have enough to support the pipe? But if you need to empty the pot to clean the pump you will have to remove all the rocks. Just depends on how much work you want to do when cleaning the pump. Friends of your parents. Your mom gave me your blog addy. You know your dad has a big pot in his back yard he wanted to do the very same thing with last year and never got around to. Question: How tall is your pot and what power pump did you use? I have a large ceramic pot I’d liek to do this with, but its at least 2.5′ tall, only a little over 1’x1′ wide at the top. Someone told me I needed a 600 gph pump, but I thought that was overkill. Help? Lest you think I’ve fallen off the face of the Earth, here’s another great DIY project (a nice way to add some water to the landscape as well). Just found your great post. I love to see how others have put there fountains together. I used PVC to hold up the fountain tube as well. To keep the PVC standing tall and centered, I used the straight piece of plastic from a clothes hanger to form a kind of cross and used criss crossed zip ties to hold it together. It has been used for two seasons now and I will use it this coming year. Durable and cheap and no rust! What size pump did you use? Hi Becky, I can’t remember the size, just that it was rated to pump to a certain height. So for a 2 foot high pot you’d want a pump that could pump water at least 2 feet (more, if you want the bubbles to go higher!). Is the 5 gallon bucket diameter large enough that you don’t get any water splashing or leaking around it from the glazed ceramic pot? 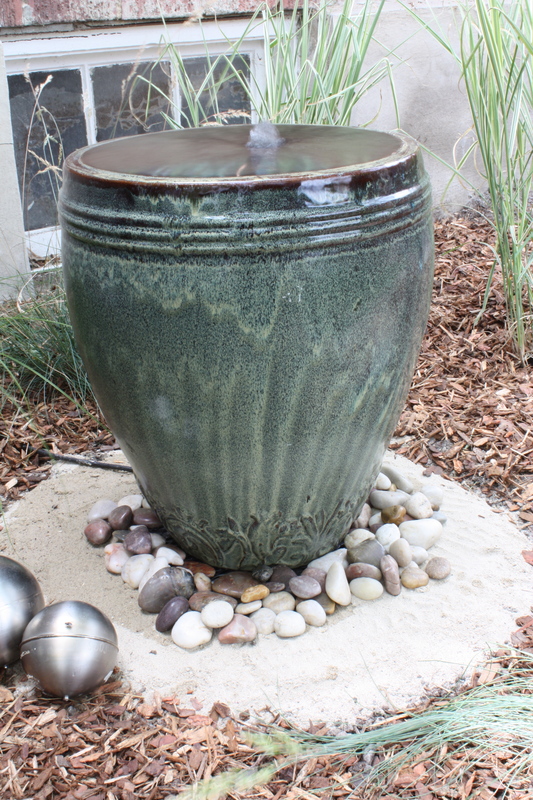 I have a 16″ ceramic pot that I’m getting ready to use for a fountain. I am concerned that it may splash and overly satuate the surrounding area if the bottom container is too small??? oh my word, I have been trying to get this done for 3 weeks! I love the look of yours. However, I bought aquarium adhesive, suggested by my Home Depot guy. It did not hold at all to my pipe. I am going to try the rubber inner tube with hot glue. Wanted to see how yours held up with the hot glue. could you maybe run the pvc from the bottom container through the hole with the hose inside and it would stay straight ? What about using the lid of the five gallon bucket to hold the pot on top. You could just drill holes into it to let the water flow through. Also, using pvc pipe with the threads would allow you to put a nut on either side of the hole to keep the pvc pipe in place to hold the hose up. What’s your take on these ideas? Very nice project! Would love to make one, just have to think of the right place to put it! Have limited space for plugging in the electric. I use overflow connecter for cooler through bottom of pot. Both sides are threaded and use same size pvc connecters inside as your pvc pipe. 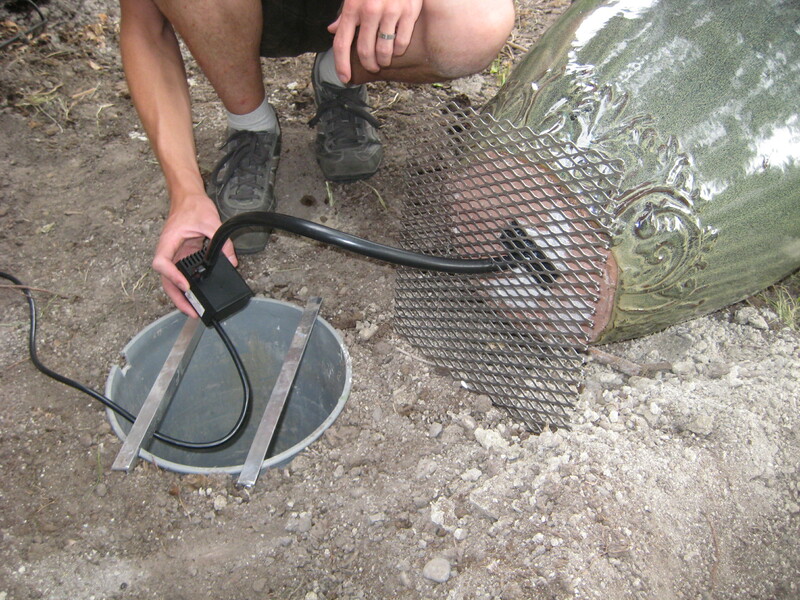 Use threaded barb adapters from pump hose to bottom of pot seal bottom inside pot with waterfall foam. Thanks for sharing your success & changes you’ve made! Thanks for taking the time to share your work. Just Wonderful. Can’t wait to try it. Very clever and creative tutorial as well. Love all the comments. I think I will try this with a lighter weight foam vase that looks ceramic. Easier to empty and clean for me, I think, and doubt anyone could tell it wasn’t ceramic unless they touched it. I made something similar and used a plastic trash can lid as the base for the pot. Drill a center hole for your hose to come thru. As a bonus to clean and winterize just lift the handles. I does require more rocks for camouflage but has worked for years. bedroom is the simpler relationship that the day becomes. Excuse me ! WTH does this have to do with this fountain. Take your crazy garbage and stuff it ! Lands a mercy get a life, why dontcha! Pretty! Please be sure to put a rock or something in the water that sticks up a little above the water line so birds and other little critters don’t drown in it, and they can have a place to get out. This is a great project and easy directions. I am definatly going to add this to my flower bed. You did a very good job. I love your bubbling fountain ! Couldn’t you have painted the metal screen to stop it from rusting ? Just a thought. Keep up the good work. Why don’t you use pvc pipe glued into the hole in the bottom of the pot? Then run your tubing into the pvc pipe. It would stay centered and still have the bubbling effect. Use a copper tube instead of pvc it will also keep the scum from forming in the pot & bucket. This also works for bird baths. Good luck! Don’t know if anyone else suggested this, but what if you stack smaller clay flower pots inside, alternating them right side up, upside down running the hose thru the middle drain hole in them, this should hold your bubble hose up straight, not rust, not be unattractive and if you did need to take it apart for cleaning it would not be a big deal. Why don’t you just fill the fountain pot with stones as well? If you don’t have a fish or plants in it, the stones should support the hose and make the whole system require less water. No rust and natural bacteria pockets should form between the stones keeping the algae down. Its the same concept as a bio filter in fish tanks and natural swimming pools. You could even fill the top portion with pretty glass pebbles. Could you spray the metal piece with some kind of stuff like, “stop rust” or something else that would of protected it from rusting. Thank you so much for posting! I am currently building a house and so wanted to incorporate one of these into my landscaping plan however, buying one “ready to plug in” was way over my budget! I will definitely use this tutorial to make one…two or maybe three of these! I like the stone idea as well (Cri post #57). Think I will try that as well! Good luck and keep posting! If you are on Pinterest…please let me know! I would love to “follow” you! You did a great job! This is really nice, I love it!
. How clever you are! You could even put rocks inside the pot, with pretty/decorative rocks on top. What a great idea. I’ve been wanting to put in a fountain, but was afraid it would be to difficult. This looks like something I could do. Thank you. 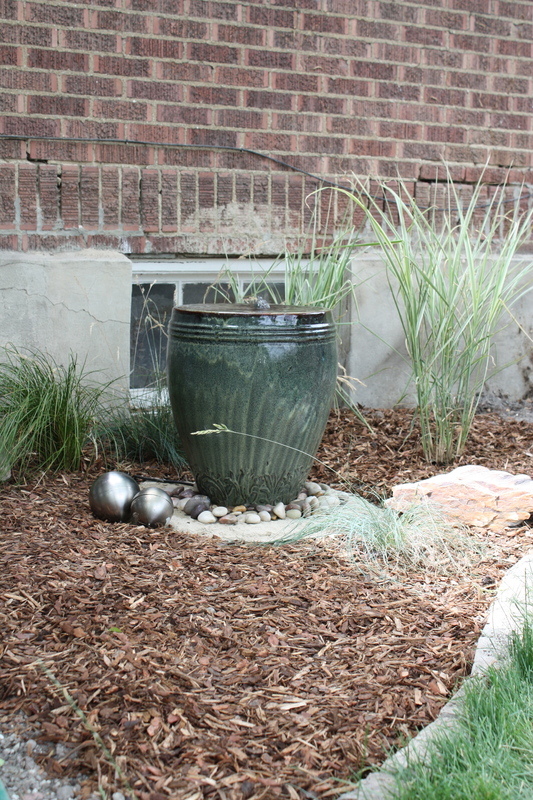 Want to create a fountain in your yard? This is a easy way to make one with just a few items! You could rubber cement a pvc phlange over the hole in the bottom of the pot and then attach the pvc pipe for the hose to run up thru. That should hold it straight. Great idea. Great thinking. Bubbling lullaby put you to sleep! 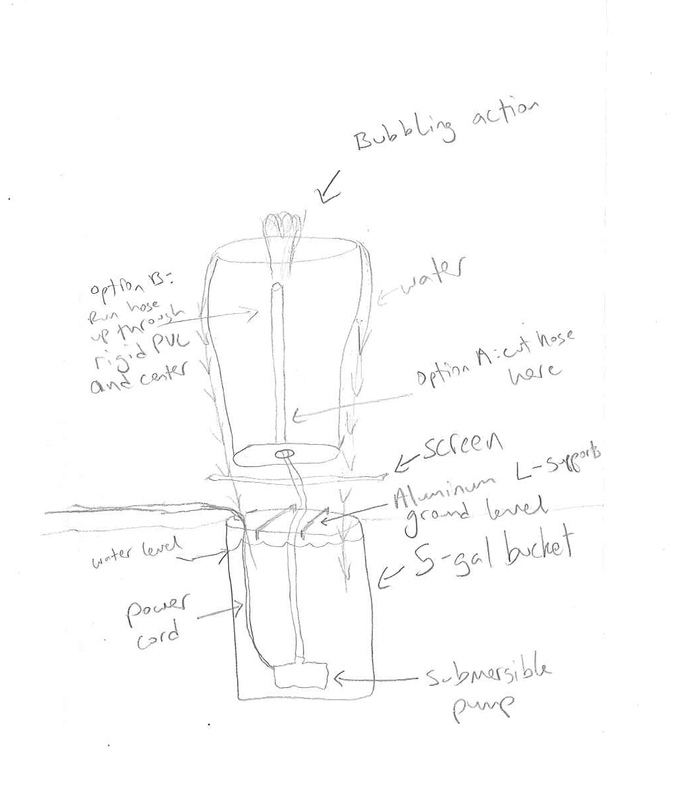 I will try on a smaller scale till I find a matching submersible pump? Sounds like such a simple but great idea. My problem is that I don’t have any electrical outlets near my garden and an extension cord is out of the question, can this be done with a solar water pump? Any ideas as to where I could locate one ? Love the project. I want to do this! Also, your instructions are very clear but the BEST part was that you apologized for prepositions at the end of your sentences! Way to go! Such fun and full of humour – can’t wait to give it a go! The pot idea was great,but that brick wall behind the pot needs attention.you don’t want wall to go down on pot. Take appropriate measures to prevent cross-contamination (keep the doors between the contaminated area and the other rooms in your home closed, do not use the central air conditioning system until the problem has been solved, keep air pressure in the contaminated area lower than in the rest of the building, etc.) to ensure that sewage contaminated soil won’t be tracked into unaffected areas of your property and airborne sewage-contaminated dust (or mold spores) won’t be blown to other spaces. I am seriously thinking of doing this project. A couple questions, do you have to change the water, also do you have ever clean the pump. Thank you.